Sir Robert Ropner & Co.
Rowland & Marwoods Steam Ship Co.
Lloyds Book of House Flags and Funnels (1912) shows the house flag of "E. F. & W. Roberts" (#344, p. 53), a company based in Liverpool, as blue with a red border and a white star in the middle. On 24 October 1898, the "Andorinha", a four-masted sailing ship owned by E. F. and W. Roberts, was involved in a big blaze that caused a loss of $300,000 in Brooklyn. A fire seems to have started on the ship and to have swiftly spread to the pier belonging to the German-American Stores. Then the blaze extended to the naval storeyard of George L. Hammond & Co. and to the three-masted schooner "Wacamaw". The whole story was reported in "The New York Times", 25 October 1898. William Robertson, Shipowners, Ltd. Griffin 1895, Lloyds 1904 and the Liverpool Journal of Commerce all show the white band being very broad with equal bands then shown by all sources from 1912 onwards, suggesting that there was a change in the basic design. Robertsons had their fleet under the name Gem Line Ltd. from the late 1950s to the early 1970s, the ship names being after minerals or semi-precious stones, then around the mid 1970s seem to have been absorbed by Stephenson Clarke Shipping Ltd.
From the website of the National Maritime Museum, "the house flag of Gem Line. A white, rectangular flag with the top and bottom edges in dark blue. In the centre is a red 'R'. The flag is made of a wool and synthetic fibre bunting. It has a cotton hoist and is machine sewn. A rope and toggle is attached." Lloyds Book of House Flags and Funnels (1912) shows the house flag of "Robertson, Mackie & Co." (#185, p. 45), a company based in Glasgow (Scotland), as white with a blue border and a red star in the middle. Sir R. Ropner Co. Ltd., West Hartlepool: Larousse Commercial Illustré (1930) shows quarterly red and white, characters counterchanged in each canton i.e. upper hoist, white `R.', upper fly, red `R.', lower hoist, red `&', lower fly, `Co' (`o' raised, no dot). No serifs. Robert Ropner's remarkable career is described on this site (click on the flag). The firm is still active in shipping but no longer independent: see its home page, then click `Company History'. From the website of the National Maritime Museum, "the house flag of Sir R. Ropner & Co. (Management) Ltd., Darlington. A rectangular flag quartered into red and white with a black and gold shield of arms in the centre. The flag is made of a wool and synthetic fibre bunting. It has a cotton hoist and is machine sewn. The shield is printed onto cotton." Sir Robert Ropner & Co. The flag apparently changed post WW2, being shown from Stewart 1951 onwards, the letters being deleted and a shield added overall. I am not sure of the charges on the shield but at some point I have noted that they included stag heads. From the website of the National Maritime Museum, the house flag of the Ross Group, Grimsby. A rectangular green flag with a five-pointed white star. The flag is made of a wool and synthetic fibre bunting. It has a cotton hoist and is machine sewn." From the website of the National Maritime Museum, "the house flag of C. Rowbotham & Sons, London. A blue rectangular flag with a white diamond in the centre bearing the letter 'R' in red. The flag is made of a wool and synthetic fibre bunting. It has a cotton hoist and is machine sewn. A rope and toggle is attached. From the website of the National Maritime Museum, the house flag of Rowland & Marwoods Steam Ship Co., Whitby. A square white flag with a blue border bearing a red cross in the centre. The flag is made of wool bunting with a linen hoist and is machine sewn. A rope and toggle is attached. The design dates from before 1934 when the company were asked to alter their colours by the War Office and changed them to a blue cross with a red border. Rowland and Marwood was created in 1890 by six steamship owners, each ship owned by shareholders, to form a larger and mutually beneficial concern. Rowland died in 1899, and Marwood in 1914, and from 1914 W. A. Headlam and his family became the driving force of the company. The tramp fleet carried mainly coal out, and then grain, timber, and many other cargoes back to the UK or European ports. They traded worldwide to ports in Australia, South America, Cuba, Canada and elsewhere on the globe. The company lost six ships in the First World War, but acquired 13 new ones in the period 1922 to 1940. The depression in the 1930s caused great difficulties, but with government subsidies in both 1935 and 1936 the company managed to keep going. After the First World War the ships were always named after local Yorkshire villages. During the first two years of the Second World War the Battle of the Atlantic took almost all of the company's fleet. The company continued trading in the post-war period, but, despite new vessels of larger size being bought in 1956 and 1962, the 'Runswick' and the 'Egton', the world economic climate proved unfavourable to small-scale cargo enterprises and in 1985 the company went into voluntary liquidation." According to Loughran (1979) the flag used after 1934 had proportions 2:3. 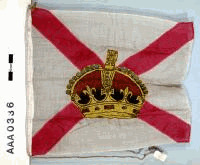 See also: Bennett S.S. Co.
Houseflag: White, with red St. Andrew's Cross and Gold Crown in center. Founded as the Royal Mail Steam Packet Company in 1839 originally between the UK and the Caribbean and Central America and extending north to Halifax and New York. Purchased the White Star Line in 1927. In 1932, became the Royal Mail Line following significant losses by the company and conviction of the company chairman Lord Kylsant for larceny (specifically having falsified the company financial books). In 1965 RML was purchased by Furness, Withy & Co and in the 1970s sold successively to C Y Tung (HK) and Hamburg-Süd (DE). Currently operates a refrigerated cargo service between South America and Europe. From the website of the National Maritime Museum, the house flag of the Royal Mail Steam Packet Co., London. A white flag with a red saltire in the centre of which is a gold cross. The flag is made of a wool and synthetic fibre bunting. It has a linen hoist and is machine sewn. The crown is printed." The image above has too much black with the jewels decorating the arches and no black for a cap base [see photo at Royal Mail Lines]. This was originally shown by the NMM under the name of Royal Mail Steam Packet Co. which as Phil points out was the company name prior to 1932, Since their [the NMM] corrections they no longer show it under this name – only as Royal Mail Lines Ltd. which as they date their flag c.1955-1967 is more appropriate. There may have been a subsequent change with the crown as this appears to be the Imperial version started with Queen Victoria and I understand the St. Edward model was adopted by Queen Elizabeth II and that companies which gained the display of the crown by being formed under Royal Charter in the first instance followed suit. The flag is forked, horizontally divided blue-red with a white diamond in the middle. Runwave Ltd., Bristol - black flag bordered red, white "R".